The weekend did not start as well as it ended for the Donegal based team, as an engine issue for Rhys in Moto3 qualifying left him unable to take his place on the grid for Saturday's opening race. A long road trip by Rhys's father Ivan, to collect a replacement engine, enabled the teenager to make the grid for Sunday's race, where he would have to start from thirty second and last on the grid, nineteenth of the Production class bikes. Caolán Irwin's weekend went much more to plan as second in the opening practice session was backed up a strong performance in qualifying. Following a tight battle the Oasis Bar and Clean Rubber backed rider produced his best qualifying of the season to line up sixth, less than two tenths off a front row start. A good getaway at the start of the race left Caolán running with the lead group, in seventh place, and by lap three he had regained sixth. Further progress was made as he then ran in fifth place from half distance until the final lap where he was just pipped for the place on the run to the flag. Caolán's strong end to the season, where he picked up his best finish since round five, meant that he never finished a race outside of the top ten on his way to ninth overall in the series. 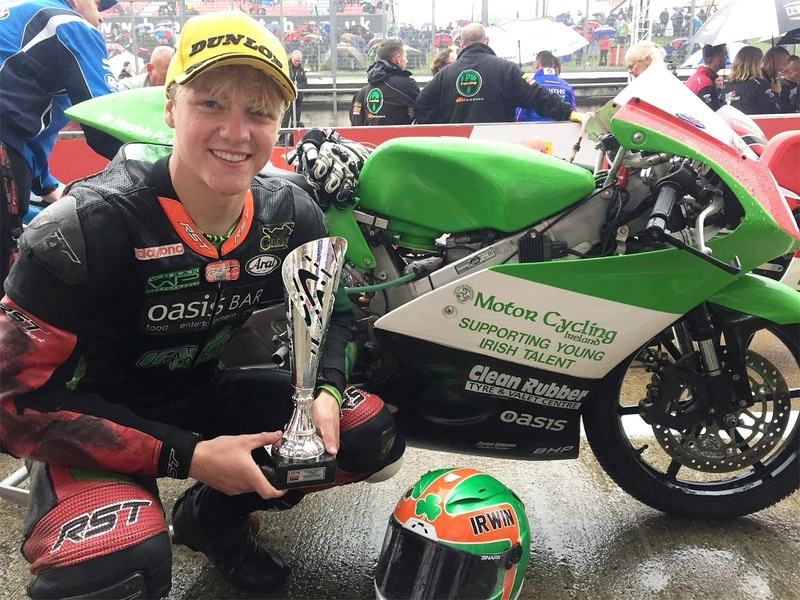 His impressive performances, including a first ever podium, at Snetterton in June, left him as the top rookie in the Superstock 600 class. 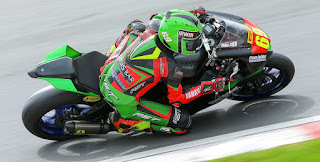 Rhys Irwin was also delighted with his final race of the year as he finished his BSB season with a podium. “After my bike blowing up on the first lap of qualifying, and having to start from 32nd on the grid, I didn’t expect that. Third position and my first BSB podium with second fastest lap of the race is a great way to end this part of my season. A massive thank you has to go out to Bradley Thurston and Stephen Knight for the loan of the engine and my team for sticking it in. I can't thank everyone who has helped get me here enough, Motorcycling Ireland, Mum and Dad, Eamonn Medlar, Wes, Galfee, Wogey, Arnie, Katy and Brad and everyone else who has helped out. Following a successful first season in BSB, Irwin Racing may be finished for 2018, but both riders still have one more event to complete. Caolán's thoughts are already on preparation for the final of the Masters Young Racer of the Year at Mondello Park on October 24th, while Rhys is looking forward to his final British Talent Cup race of the season at the MotoGP finale in Valencia, Spain, on November 17th & 18th. For more information on Caolán Irwin see www.irwinracing.ie.